The aggregation of these posts will result into a research report available for reprint rights. Technology veterans often observe that new mega trends emerge every decade. The market has evolved from mainframes (1970’s); to mini computers (1980’s); to client server (1990’s); to internet based (2000’s); and now to cloud computing (2010’s). Many of the cloud computing trends do take users back to the mainframe days of time sharing (i.e. multi-tenancy) and service bureaus (i.e cloud based BPO). What’s changed since 1970? Quite plenty — users gain better usability, connectivity improves with the internet, storage continue to plummet, and performance increases in processing capability. 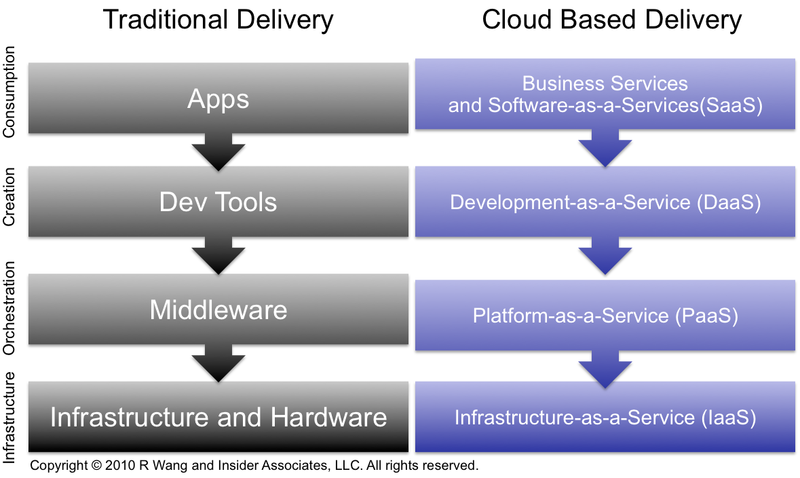 Business Services and Software-as-a-Service (SaaS) – The traditional apps layer in the cloud includes software as a service apps, business services, and business processes on the server side. Development-as-a-Service (DaaS) – Development tools take shape in the cloud as shared community tools, web based dev tools, and mashup based services. Platform-as-a-Service (PaaS) – Middleware manifests in the cloud with app platforms, database, integration, and process orchestration. Infrastructure-as-a-Service (IaaS) – The physical world goes virtual with servers, networks, storage, and systems management in the cloud. Solution providers and partners will invest in value added solutions over commoditized infrastructure. 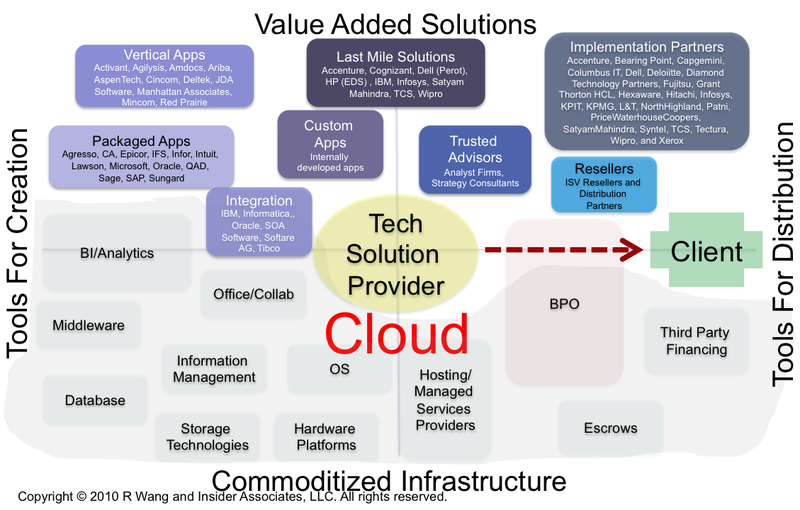 The continued commoditization of technology results in richer and more relevant Cloud stacks. As a result, a handful of larger players will emerge to drive down the costs of computing while encouraging ecosystems to deliver value added solutions. Buyers can expect packaged apps, vertical apps, last mile solutions, and implementation partners, to invest in specialized and higher value intellectual property (IP). Integration will emerge as the key enabler and choke point. End users need an enterprise apps strategy for cloud computing that addresses the “I” word – Integration. SOA principles must be enforced including support for canonical data models and business process haromonization. Integration must focus on data mapping, business process orchestration, quality of service, and master data management. The Bottom Line For Buyers – Use The Tech Ecosystem Model To Build Out Your Technology Roadmap And Procurement Strategy.